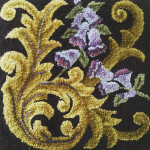 This page presents the artistic creations of BVAA member Ellen Gould. I have always loved to create beauty. In my earlier years I spent some time with formal training at an Art school but found that creativity for me was best expressed in my everyday life. I have spent countless hours immersed in creating with paint, cloth, papier-mâché and wool. 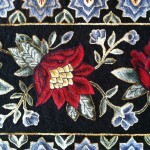 But traditional rug hooking, a craft practiced for thousands of years, became an immediate love. This magical process of pulling a loop of fabric through a linen backing fills me with a sense of accomplishment and has become not only a craft but an art. This concrete, repetitive work frees my imagination and quiets my mind. I hand dye my wool yardage, color plan my patterns and give lessons to those looking to learn this age old craft. My studio is in my home at Sisters Three Farm in Mendon, Massachusetts and much of my inspiration comes through my window and while at work with my miniature goats and canine companions on the farm. 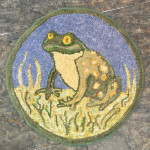 I hope to convey some of my world through my hooked rugs.